After a soggy grey week, expectations for the weekend were low. But it was the YAC club hut meet in Snowdonia so in went the crampons and ice axe, though most of us were convinced wellies and a snorkel were likely to be more useful. Guido and I had arranged to share a lift and as I was in London the previous day decided to travel up on the Saturday morning at 6am – yikes. As we drove over, the weather didn't seem to improve much. We decided a low grade scramble was a good bet, and picked on a combination of Central Buttress on the East face of Tryfan followed by Bristly Ridge (which is on something else). Arriving in Snowdonia things started looking up – the tops were definitely white – looked like a light sprinkling of snow on top so into the sacs went the crampons etc. As we gained height the snow cover got thicker, we couldn't spot the path so it was heather bashing for us in deepening snow. By the time we reached Heather Terrace and the start of our route, conditions were definitely wintry, but it was all soft loose snow. Guido pronounced the initial obstacles to be on the tricky side so as he had a complete winter novice – me – in tow, decided we should rope up. Since the snow was too soft to use axes effectively I was then introduced to the dark art of Dry Tooling. Which I have got to say is huge fun – once I got the hang of it, I was suprised what a good hold (is that the word? sounds wrong) you can get on small edges and cracks with your axe, and how solid it felt. Solid is not the word I would have used for the snow – it was of the "steps that collapse under your weight" variety, which felt quite exciting on a steep slope. At one point I had both legs submerged up to the knees in snow, struggling to achieve a balance between pushing hard enough to extract my feet without making it collapse further. We also took longer than expected as we only had a short rope with us, so had to rebelay every 30? metres or so. Never mind, it was completely exhilarating, the sky was now blue with the crags outlined sharply against it and every now and again I remembered to look round slack jawed at the views down into the valley. Arrived at the top completely blown away by the experience and very chuffed to have done my first winter route. Unfortunately we ran short of time to do Bristly Ridge – by the time we got there the sky was turning pink and we decided not to spoil a brilliant day by pushing our luck so headed for a traditional finish at Petes Eats. Arrived at the hut, and several hours after darkness Simon Carmen and Rob also arrived, having spent the day searching for ice on the Black Ladders. Carmen and Simon then fed the masses with haggis and neeps and Carmen's amazingly good soup. Next day it pished down but who cares after such a brilliant Saturday so me Guido Carmen and Simon headed off to beast ourselves at the Beacon Climbing Centre, Rob went for a walk and the bikers did something bikey. Another Saturday, another HPM recce. This time Alan couldn't come because his house had blown down (or something like that), but Will wasn't quick enough with the excuses. We dropped Will's car off at Snake Pass and drove back to Cut Throat Bridge to do the 17 mile section in between. We were having second thoughts as we drove up towards the pass in driving rain and hail, but somehow by the time we left the car, the clouds had gone and the sun was shining. Conditions were very different from the week before, with the ice replaced by mud, but the sunshine made it feel like Spring, and we made good progress as far as Cut Gate. I even worked out where we'd gone wrong the previous week. After that though it all went horribly wrong. We'd been up here before, in the Grin 'n' Bear It 2007, and I had memories of bogs. But it was all so much worse than I'd remembered, and any attempt to wade led to retreat through knee-deep quagmire, followed by lengthy detours to get round the boggy bits. And it didn't relent. Every time we began to think we might be past the worst, one of us inevitably started sinking. To make matters worse, the sun had gone behind threatening clouds and a cold winds had picked up. It took us about 3 hours to do the next 5 or 6 miles, but felt like eternity, as we collectively lost the will to live. Navigation up here is going to be a nightmare in the dark. 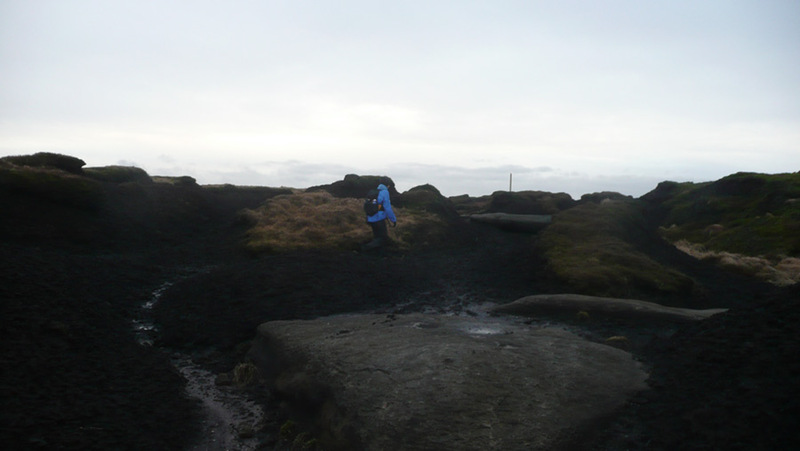 So bad were the bogs that the 2 miles of peat hags we encountered when we finally reached Bleaklow Stones came as a blessed relief. We even managed to find a path through this area (or at least, an almost continuous channel with a few cairns, footprints, and bleached bones of previous visitors). 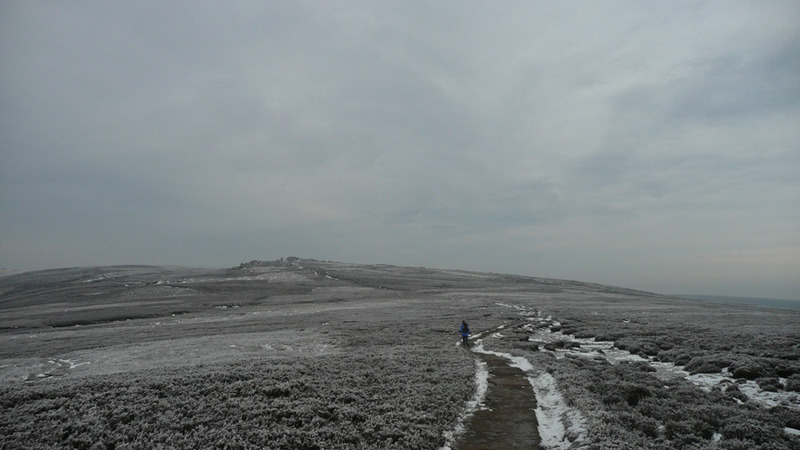 An hour later we reached the Pennine Way, just below the Wain Stones. A unanimous decision that we couldn't be bothered to go up the hill to find the location of the checkpoint, and we all ran down the PW flagstones towards Snake Pass. 17 miles, 6 hours 10 minutes. If we get through this bit in one piece on the night then we'll almost certainly get to the end! At least the rain held off until 10 minutes after we finally started the drive home. Once again we have to run a plan B as our main Scottish event has been cancelled due to the weather. Today I awoke to high winds & heavy rain but the met office promised us a clear window for a few hours. I picked Jim up at 10.00 and headed west we were still driving through the occasional storm but generally things were improving. The next question was where to go, we were really spoilt for choice, the idea was to recce some of the obscure climbing areas that we had never been to before, to see if they were worth visiting on a better day. We eventually plumped for Nidderdale and first port of call was Sypelands, when we arrived it was cold & windy & a recent squall had dumped a lot of water. This venue has great potential & will be ideal for an early summer evening visit, before the bracken is up. There is one amazing boulder called ‘Tib’s Tent’ worth a visit on its own. We then moved onto Slipstones area & walked past the main edge to Brown Beck Crag this is just like a shorter version of Slipstone and has some superb little routes. A few hardy souls were bouldering but it must have been very cold. Brown Beck crag is another great little crag very similar to Slipstones the only problem is that you have to thrash through the heather to get there. We did far too much for a detailed report (cue audible sighs of relief all round) so here's a summary. There was not much snow about, but temperatures were around freezing all week (usually well below) so the ground was frozen hard, with quite a bit of water ice, especially on paths and in the glens. A high pressure system was sat over us for the whole trip, giving mostly light winds and sunny skies. The main occasional problem was the low cloud that often came in from the east, except when it came from the west, so predicting the best direction to head in was largely down to luck. So we travelled east, west, north, and south, and occasionally stayed close to the hut. Overview on Google Maps. Saturday 27/12. Wall-to-wall sunshine for a round of the three Munros south of Loch Laggan – Creag Pitridh, Geal Charn, and Beinn a' Chlachair – with Rob. Good views of the clouds that obscured all hills east of Ben Alder, so a lucky choice of hills. Descended by the rarely visited SW ridge of Beinn a' Chlachair in order to stay in the sun for as long as possible. Route Map. Sunday 28/12. A big day. Cycled 8 miles from Dalwhinnie to Loch Pattack, then abandoned bikes for a walk up Ben Alder (via a scramble on the Long Leachas) and Beinn Bheoil (where we unexpectedly met 2 other walkers), before a long cycle out in the dark. Rather overcast for most of the day with the summits mainly in cloud, which made navigation across the Ben Alder plateau quite interesting. Route Map. Monday 29/12. A shorter day round the Munros west of Drumochter Pass. In the clag all day, with a bitterly cold wind. Carmen only needed the first summit (Sgairneach Mhor), and I'd done them all before, but we made more of a day of it by carrying on to the next two (Beinn Udlamain and A' Mharconaich) before leaving Rob to add the fourth (another Geal Charn). Route Map. Tuesday 30/01. The forecast was for sun, and it didn't disappoint. We left the Whitewell carpark (near Aviemore) at 8.25, just before sunrise, and walked down Glen Einich with the intention of climbing just Braeriach. Conditions were so good when we reached the plateau that we added on Cairn Toul and Sgor an Lochain Uaine for good measure (narrowly missing heading south towards Monadh Mor by mistake! ), finally reaching the summit of Braeriach at sunset. All that remained was a 7.5 mile walk out via the Lairig Ghru, most of it in the dark, arriving at the car at about 7.10. Total distance 22 miles. Arrived back at the hut to find that the water supply (ie burn) had frozen so there were no showers for the rest of the week. Joined the others in the pub. Route Map. Wednesday 31/01. Another forecast of sunshine. A 6.30 alarm call got us to Tulloch Station in time for the first train to Corrour, to do the 2 Munros SE of Loch Ossian (Sgor Gaibhre and Carn Dearg). Disappointingly cloudy for the long walk by the loch, with the hills obscured. But we walked up through the clag for the most magnificient inversion I can recall, peaks in all directions emerging from a sea of cloud. And it got even better on the last summit, with a series of Brocken Spectres added to the mix. It was a shame we had to descend back into the gloom to get the last train back. Route Map. Thursday 01/01. A late start after a late night, we set off to do Geal Charn (the one in the Monadhliath this time). We left Ben's car at Garva Bridge, and started walking from the Spey Dam. We walked up via Glen Markie (interesting river crossing, luckily the ice held!) and descended via Beinn Sgiath and the SW ridge. More clouds today, and no inversion. But we did find ourselves in a gap between layers, with clouds below us, and above us, and a view of cloud-draped summits in between. Route Map. Friday 02/01. Carmen's final Monadhliath Munro, Sgurr Dearg. A cold mist in the valley, but sadly no inversion. However the clouds did clear gradually, giving superb views of the Cairngorms which were completely clear of cloud, and then the hills to the northwest, similarly bathed in sunshine. Our hills took a little longer to clear, but did so in time to decide to extend the day, following the old fence posts for a few miles to add the two easterly Munros (Carn Sgulain and A' Chailleach). Route Map. Saturday 03/01. Decided to head northwest to get some of the sunshine they'd been enjoying for most of the week, so drove for 90 minutes to Loch Quoich, just south of Glen Shiel to climb Gleouraich and Spidean Mialach. Unfortunately this seemed to be just about the only part of Scotland that didn't get sunshine that day. But at least the cloud base was above the summits, so we got good views of the sunny hills elsewhere! The view up Loch Quoich towards Sgurr na Ciste is a contender for the finest in the country. Route Map. Sunday 04/01. Cloudy with light snow. Drove home. A tiring week, we kept waiting for the weather to break so we could have a rest day, but it stayed stubbornly fine. A total of 19 Munros in 8 days, and I even managed 6 that were new to me! Lots more photos can be found here. 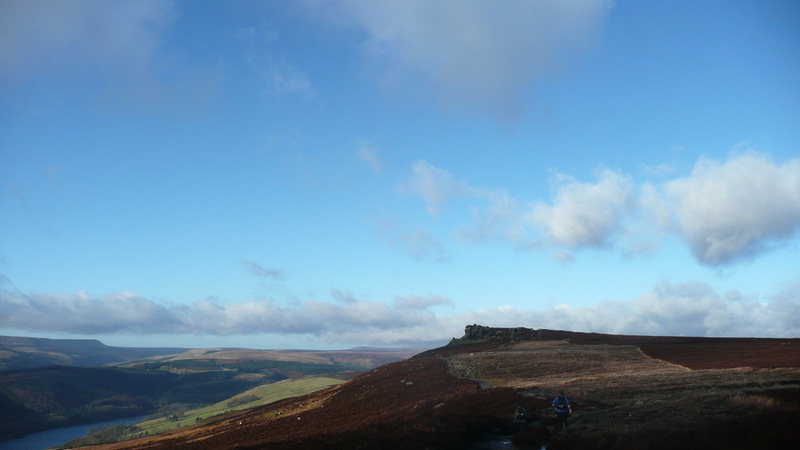 Last November, a few of us (Alan, Will, Carmen and I) put a team together and applied for this year's High Peak Marathon, on the mistaken belief that we stood no chance of getting a place (it is always oversubscribed by at least 300%). Sadly our hopes were cruelly dashed last December when we were told that we were in. 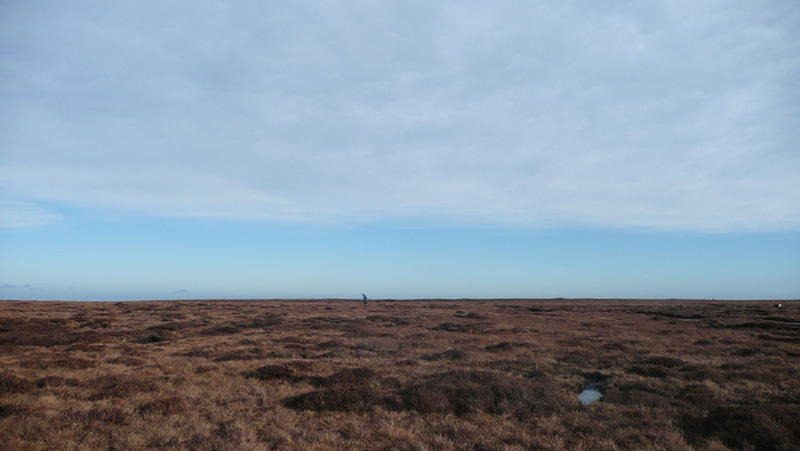 40 miles of the finest peat hags our country can offer, starting at 11.30pm on a Friday night in March – should be a doddle. This weekend, we'd hoped to head for the Lakes for some winter fun before the ice melted, but having established that we were a day too late, we switched at the last minute and decided to investigate part of the HPM route. Will and Alan were both busy due to the complete lack of notice, so it was just the two of us. After a lazy start, we parked at Cut Throat Bridge at about 12.30. The next section heads back uphill and regains the watershed. We managed to lose the path at this point, which doesn't bode well for doing it in the dark! A short flat and featureless section follows before we picked up a good path again towards Margery Hill and then Cut Gate, and since it was by now almost 3pm we decided to call it a day and descend to the valley, where we followed a forestry/water board track back. This was rather further than it looks, and hard on the joints as it's effectively road running for most of its length, luckily we won't have to do this on the day. Got back to Cut Throat Bridge just before 5.30. About 17 miles round trip, and quite fun (except for the valley bit) despite the bitterly cold wind. Here's the route we took. 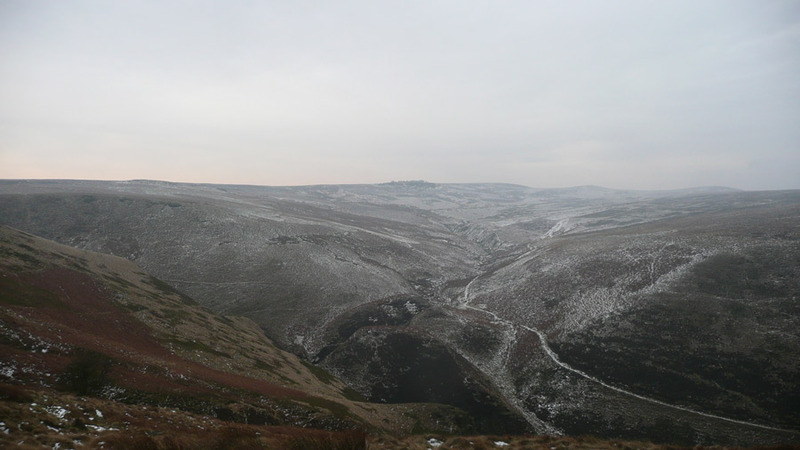 You are currently browsing the York Alpine Club Blog blog archives for January, 2009.